Two things that make Budapest a destination with a difference are the coffee houses and the thermal baths. However, though the inventive Magyar can claim many things (Vitamin C, Rubik’s cube and the hydrogen bomb amongst others) as their idea, these two tourist attractions most associated with Budapest can both be attributed to the Ottoman Empire. However, if you were taught history in a Hungarian school, that’s probably not the way the Turks were depicted. 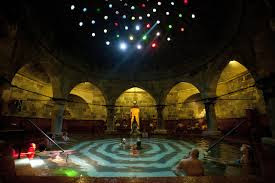 "Decades of disinformation have told only negative aspects of the Ottoman occupation," said Victoria Hill, a dynamic American businesswoman who lives in Hungary and is determined to save the crumbling Turkish baths in Hungary’s capital and see them find their rightful place on the Unesco World Heritage list of outstanding natural and man-made treasures. Hill has formed the tentatively titled Friends of the Baths, a cultural group which will meet regularly for lectures and discussions on Ottoman culture and its previously neglected influence on Hungarian life "The widely-held belief that Hungary languished for a century and a half during the Ottoman occupation is simply not true," said Hill. There was a thriving economy in Buda during the time, primarily due to its position on the caravan route. 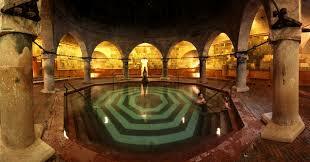 Buda, with its remaining architecture and thermal baths offers, a flashback to Ottoman times. Hill hopes that this small collection of living, breathing monuments will be preserved for the enjoyment and fascination of generations to come. The first meeting of the Friends was held in the wine cellar of the Gundel restaurant. "It is difficult to get the Government or the city interested after more than 50 years of de-emphasised, dis-education about foreign cultures. However,from my experience I have found that Hungarians are always interested in their history," said Hill. "This is a part of the cultural heritage of Hungary that has been ignored or neglected." At the initial meeting, Hill gave an overview of the Ottoman Empire which lasted from 1302 to 1924. "The Ottomans are very important to us in the West because they created forms of state administration; the ways in which they operated created the threads for democracy now," said Hill. She illustrated her fascinating talk with slides showing maps, exquisite tiles and paintings which captured the moment as accurately as a camera. There were pictures from the preparation for a circumcision of Mehmed in 1582, when the celebration lasted 52 nights and 52 days, and wrestling performances and tightrope walking revealed in miniature books which acted as a newsreel of the time. A map of the Ottoman Empire at its height showed the rich trade routes and the extent of the power, north to Buda and Vienna, east to Persia and Georgia, south towards Saudi Arabia. Sultan Süleyman the Magnificent brought the Empire to its zenith. As the fourth Ottoman sultan, he presided over the most powerful state in the world, from 1520 to 1566. He was a cunning military strategist and more than doubled the territory inherited from his father. He built elegant mosques, baths, schools, fountains and gardens. Few people know that Süleyman the Magnificent died on Hungarian soil on the way to the attack on Vienna. Buda was once home to 26 mosques. Today only the baths remain from Buda’s imarets (inns or hospices). Situated from south to north along the Danube these are the Rudas, pictured right, Rác, Király, Lukács and Császár baths. In addition to the baths there are two other Ottoman architectural relics that still exist in Buda: The Malomtó gunpowder mill and the Gül Baba Tomb. Only the outer structure of the earlier building at the Malomtó remains. 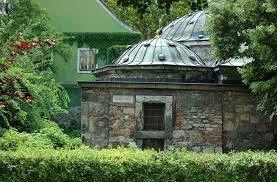 The Gül Baba Tomb, however was completely renovated in 1962 and is preserved as a gift of the Turkish government. The first baths on the site of the Rudas date from the late 14th century. The exact date isn’t known, although renovation and expansion work was carried out in 1566. The new building was constructed by the Pasha of Buda in the 16th century and his plaque remains in the main chamber. The original cupola, vaulted corridor and main octagonal pool remain, although heavily restored. There are several reasons to believe that this work might have been carried out by Sinan, a Greek architect and contemporary of Michelangelo who designed 30 mosques and lived to the age of 99. He was a maths genius who revolutionized Muslim architecture and created incredible, huge domes. Sinan was the royal architect at the time when Süleyman the Magnificent died. The size of the Rudas cupola is unique. It is the largest in Europe and only two of its size exist in Turkey. The type of pillar used in the steam room of the Rudas matches Sinan’s style of work. He was also working on an aqueduct in Belgrade in 1565, only one year before the Rudas reconstruction, and it would have certainly been a much shorter trip to Buda than to travel back to Istanbul. During the 1500s, the Rudas also housed either a Tekke (lodge) or a zaviye (hostel for travellers) run by Dervish monks. Only the ground floor of the former three-story building remains. Bombing during the Second World War destroyed the upper two stories. There has never been sufficient funding to fully restore the building. Hill estimates that between $8 and $15 million are needed to renovate the Rudas Baths. "It has not been touched since 1945 and is waiting for an investor like the Rác has found in Miklós Bornemisza’s Rác Nosztalgia Kft, who plan to enlarge the bath territory, build a hotel and restaurant complex and even create a chair lift leading from the Rác up to the top of Gellért Hill," said Hill. The Rác Baths were originally built during the time of King Mátyás. It is believed that an underground passageway connected the baths to the Royal Gardens in the southwest side of the Castle. Later in the 16th century, the Ottomans added the cupola that remains to this day.